Living in Houston again, among family and friends and old haunts, I’ve been thinking a lot about home. Coincidentally, The Wangs vs. the World — one of five novels by different female Chinese-American authors that I recently read — touched on the concept of home and, in several ways, really stuck with me. For the first time ever, I felt like a book was written for me: For second-generation kids who grew up straddling and blurring edges of dueling identities, and for anyone who visited their family’s ancestral land for the first time as an adult and felt strangely at home there. The Wangs vs. the World covers the aftermath of the 2008 financial crisis and how the loss of wealth, stability, and status sends the Wang family on a cross-country road trip that makes up the bulk of the novel. While I haven’t quite experienced that sudden financial blow and the consequential chaos, I could relate to patriarch Charles Wang’s feeling of having come home when he arrives at “the land in China” that his family had fled and that he’d never seen til the events of this novel. I could relate to Charles Wang because, in September 2017, I traveled to China with my grandmother, uncles, and husband to my grandmother’s ancestral home, which she hadn’t seen in 74 years and where we received the warmest welcome from family whom my uncles, husband, and I had never met. I had never been in China before. I don’t speak or read or understand Chinese. I had never met any of the distant relations who so generously hosted, fed, and transported us. And yet, somehow I felt as if I hadn’t simply come home — rather, I’d returned home. It’s traditional in China to go home during the 40-day period that is Lunar New Year — frequently, to the rural towns and villages that urban workers rarely otherwise have the time to visit. Traditions observed throughout the month-long celebration can vary widely, but one remains universal: Whether in China or elsewhere, the Chinese New Year’s Eve dinner is an annual reunion for many families. Tonight in Texas, we’ll enjoy a Chinese New Year’s Eve feast with my grandmother, uncles, parents, brother, and husband. But even as I look forward to this special time with family, my thoughts turn also to that tiny village in China that, for three days, was my home. And so today, I’ll start sharing film I shot during our trip to my grandmother’s ancestral village. Shooting film has always been a deeply personal, completely intentional practice for me. Committing my first and second impressions of our homelandcoming permanently, tangibly, on film was a particularly intensely personal process. 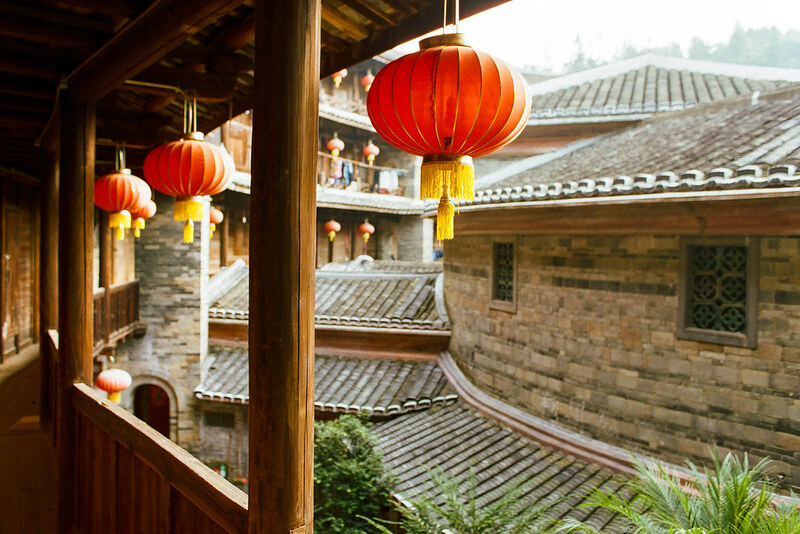 Even months later, it seemed unreal somehow that I’d actually visited my grandmother’s tulou, that we’d been so completely welcomed by family she either hadn’t seen since the 1940s or hadn’t met, that we had — if for only a few days — come home. I guardedly showed the film only to close family members, feeling as if sharing it to the broader world meant exposing, and consequently losing, a recently discovered but deeply hidden part of myself. But now, just over 500 days later, I’m ready. After all, Chinese New Year means new beginnings, fresh starts, and homecomings. This homelandcoming series will feature a selection of the film I shot in China. Some frames show the postcard-perfect scenery of earthen buildings practically untouched by time; others reveal the everyday details that fascinated and amused us, and served to remind us that modern-day life continues for the residents who remain. As a whole, this series is not a comprehensive visual diary of our trip — rather, it is a selection of a selection, showing the intersections of history and modernity, of authenticity and tourism, and of foreign and familiar. © 2017. Zhencheng Lou (振成樓) in Hongkeng Village, Yongding County, Fujian, China. Thursday, Sept. 21, 2017. Portra 400, Canon EOS A2.